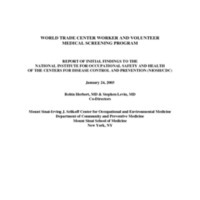 [pdf document, Robin Herbert, MD & Stephen Levin, MD, World Trade Center Worker And Volunteer Medical Screening Program, Mount Sinai School of Medicine; January 24, 2003] The full text of the preliminary report an analysis of physical examinations, symptoms and hazardous exposures experienced by an initial group of 250 participants in the World Trade Center Worker and Volunteer Medical Screening Program. The results document that approximatelyhalf of the sample experienced persistent WTC-related symptoms up to one year following the New York terrorist attacks. The authors conclude that these results indicate the need for medical treatment and a long-term monitoring program. “Report Of Initial Findings To The National Institute For Occupational Safety And Health of The Cente,” September 11 Digital Archive, accessed April 19, 2019, http://911digitalarchive.org/items/show/2946.